Additionally, we think that with all the progress made in automotive engineering recently, manufacturers should have been able to come up with a lightweight retractable hardtop that doesn’t spoil the lines or consume all the boot space. The R8 Spyder looks elegant with canvas top raised, but the security and longevity of a solid roof is invaluable. Audi is not alone; we can aim this critisism at most supercar manufacturers. Thinking of parking your pride and joy on dodgy territory ? The solidity of your roof will hugely influence your decision on which toy you’ll pluck out of the garage. A stunning new take on the much lauded Audi R8 opens to the public – quite literally – at the 2009 Frankfurt Motor Show (September 17-27). The new R8 Spyder with fully automatic lightweight fabric hood brings added wind-in-hair intensity to the already extreme driving experience delivered by the lightweight aluminium, mid-engine and quattro-equipped super car. Based on the 525PS, 5.2-litre FSI model, but featuring a bespoke body incorporating additional weight-saving carbon fibre composite panels, the new open-air R8 will be available to order in the UK from November in six-speed manual and six-speed R tronic automated manual forms priced at £111,955 OTR and £117,155 OTR respectively. UK deliveries will start in the first quarter of 2010. The sculpted lines of the emotion-packed R8 have been subtly re-interpreted to create the new Spyder. The absence of the distinctive side blades that extend into the roof of the fixed head R8 Coupe has been compensated for by the use of elegantly curved new side panels made of carbon fibre composite that blend beautifully with striking arched and vented cowls behind the cockpit which flow apparently seamlessly into the gently curving carbon fibre composite cover for the hood compartment. Whether in this compartment or attached with absolute precision to the windscreen rail, the soft top blends harmoniously into the R8 design, and weighing in at a mere 30kg it also avoids impacting negatively on the dynamic aspects that have brought this car worldwide acclaim. Electrohydraulically controlled, the hood opens and closes in 19 seconds at speeds of up to 31mph, and when lowering folds like a Z beneath the automatically activated cover of its storage compartment above the V10 engine. The heated glass window, which is separate from the fabric hood, is lowered into the bulkhead. It can be independently raised and lowered at the touch of a button, with the top up or down. An additional net-like wind deflector is fitted as standard and can be latched into the bulkhead behind the seats in two easy steps. The top, which comprises an outer skin of a waterproof textile fabric and a headliner, is fully compatible with high-speed driving. When driving at moderate speeds with the top up, interior noise levels in the R8 Spyder are barely higher than in the Coupé. The bulkhead includes integrated rollover protection in the form of two strong, spring-tensioned plates. Head/thorax side bags in the backrests protect the passengers in the event of a side impact. Full-size airbags stand at the ready in the event of a head-on collision. In a rear-end collision, the integral head restraint system reduces the risk of whiplash injuries. In the version with manual transmission, the R8 Spyder 5.2 FSI quattro weighs only 1,720kg thanks primarily to its aluminium Audi Space Frame (ASF) body. Despite reinforcements in the area of the sills, the centre tunnel, the rear wall, the floor pan and the A- and B-pillars, the body weighs only 216kg – just 6kg more than that of the R8 Coupé. The high rigidity of the ASF body, which includes an integrated engine frame of ultra-lightweight magnesium, provides the foundation for the car’s dynamic handling and superior safety. Safety, and visual appeal, are also enhanced by the all-LED headlights which are standard equipment, and a so far unparalleled world first for Audi. Light-emitting diodes are used for the low beams, the high beams, the daytime running lights and the turn signals. With a colour temperature of 6,000 Kelvin, the LED light is very similar to daylight, making it easier on the eyes when driving at night. Additional strengths include excellent light distribution, long service life and extremely low energy consumption. The open-top two-seater from Audi features a spacious, typically high quality interior that, helped by a front luggage compartment with a useful 100 litre capacity, is genuinely comfortable and practical enough to make everyday use a pleasure rather than a chore. The low-mounted, electrically adjustable seats position the body perfectly in relation to the flat-bottomed steering wheel and the clear, logically arranged dials. The generous standard equipment list for UK models includes an extended leather package featuring Fine Nappa leather, the Audi Music Interface iPod connection system (or a CD changer as required) linked to a Bang & Olufsen sound system, heated seats, DVD satellite navigation and – in another world first for Audi – seatbelt-mounted microphones which make it possible to talk on the phone even with the top down on the motorway. Like its Coupe relative the Audi R8 Spyder 5.2 FSI quattro, which was developed in cooperation with quattro GmbH, delivers absolutely uncompromising performance. The naturally aspirated V10 engine with its aluminium crankcase, much of which is hand-built, produces 530 Nm (390.91 lb-ft) of torque at 6,500 rpm and peak output of 525PS at 8,000 rpm as it revs freely to its 8,700 rpm limit. Performance reflects this awesome potential: 0 – 62mph in 4.1 seconds; 0 – 124mph in 12.7 seconds; a top speed of 194mph for the six-speed manual version – all delivered with a heady ten-cylinder soundtrack that is of course even easier to savour in this open-top model. The 5.2-litre engine with FSI direct fuel injection has a high 12.5:1 compression ratio that contributes to the high performance and also to a 19.0mpg combined economy figure for the manual transmission version that is an impressive achievement considering this car’s performance capabilities. With R tronic, this figure improves to 20.3mpg. Dry sump lubrication, another motorsports technology, ensures that the supply of oil is maintained even at the maximum lateral acceleration of 1.2 g.
The optional six-speed R tronic transmission offers a normal and a sport program as well as a fully automatic and a manual mode. The manual mode allows the driver to make lightning-fast gear changes using the lever on the centre tunnel or with the paddles on the steering wheel. The open-air sports car also comes with “Launch Control” – a program that manages engagement of the clutch perfectly to maximize acceleration at start. The quattro permanent all-wheel drive features a central viscous coupling and distributes power to all four wheels with a heavy rear bias. It works together with the locking differential on the rear axle to provide significantly greater traction, stability, cornering speed and precision. 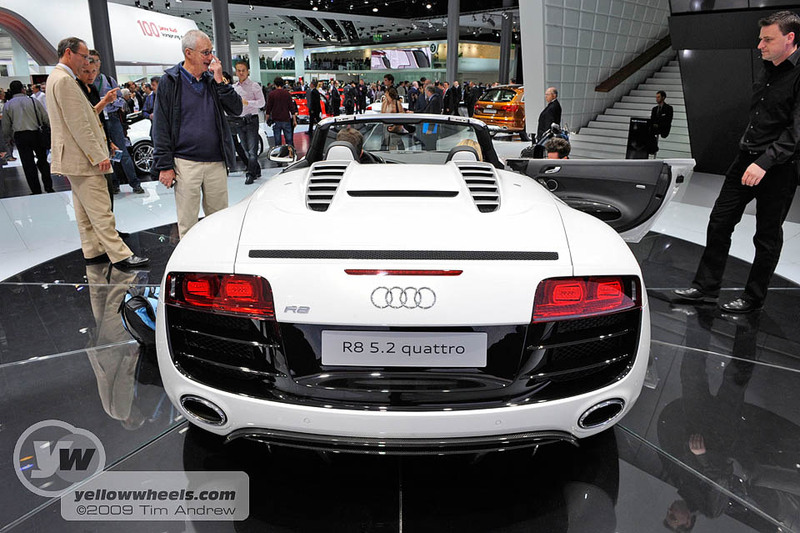 The Audi R8 Spyder 5.2 FSI quattro has a 2,650mm wheelbase and a 43:57 axle load distribution. Double triangular wishbones made of aluminium suspend all four wheels, and Audi magnetic ride optimizes composure both in terms of ride comfort and handling. The system uses magnetic fields in the shock absorbers to adjust their response to road conditions within milliseconds and adapt to the driver’s style. The driver can choose between two settings. The R8 Spyder 5.2 FSI quattro rides on 19-inch 10-spoke Y design alloy wheels. The front rims are shod with 235/35 tyres, with 295/30 tyres at the rear. 305/30 tyres are optionally available. The brakes offer impressive performance: The four discs are internally ventilated and perforated, with eight-piston callipers up front and four-piston callipers at the rear. Carbon fibre-ceramic discs that are extremely lightweight, robust and long-lived are available at extra cost. The ESP stabilization system has a Sport mode and can also be completely deactivated. The brake system includes a Hill Hold Assist function that facilitates starting on gradients.